There’s no doubt about it: winter has arrived. If you’re attending a school in a colder part of the globe, you’re probably already experiencing the chilly gusts of wind and the occasional snowfall dusting the ground. If you’re from a warmer climate, chances are good that the cold might have caught you a bit off guard, and you might be feeling a bit appalled at how people can live in such terrible temperatures. However, while “the weather outside is frightful,” the lyrics of that classic Christmas tune ring true: a roaring fire, and all the other wonderful elements of the Christmas season, are delightful. Nevertheless, it’s a good idea to make sure you’re prepared for the subzero temperatures that are sure to hit at one point or another during the winter. We’ve put together a list of winter gear you might want to consider investing in—or at the very least, add to your Christmas list. Few things are more necessary in a cold climate than a warm winter coat that keeps the wind out. When you’re walking to and fro classes or attending that impromptu sledding event, you won’t be sorry you’re wearing something that’s water-resistant and keeps the heat in. Buying a good coat can feel overwhelming—especially because they’re usually quite expensive. However, it’s worth saving up for or giving it most of the real estate on your Christmas list. If cash is tight for you, consider shopping around at some thrift stores or consignment shops. Name-brand coats like dated Columbia and Patagonia styles often end up at thrift stores, and you never know when you’ll find a great steal! It might seem like an obvious thing you’ll need to purchase, but it can be easy to go days and weeks and even months tromping around campus through the snow in nothing but your sneakers. If you’ve resorted to this, you’ve probably already experienced the unwelcome feeling of cold, wet snow creeping down your ankles and pooling under your heels. You also are probably living with some very cold toes. 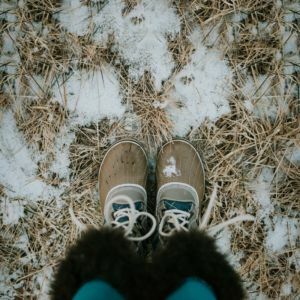 Investing in a pair of good boots can be a game changer, and you’ll suddenly be able to walk places in the winter you normally would have avoided. No longer will the weather keep you inside! With boots, you can take leisurely winter walks, participate in a good snowball fight, and walk to class without freezing your toes off. Make sure whatever boots you decide to purchase are waterproof. There’s always a certain temperature that hits when you’ll suddenly realize that you need mittens or gloves to do just about anything outdoors without getting frostbite. While mittens are generally warmer than gloves because they keep all your fingers together, gloves provide some more versatility in what you can grab and maneuver while your hands are encased. While a really nice pair of mittens or gloves might be expensive, thankfully, most pairs of gloves and mittens are fairly affordable. Layering up is important in the winter, and insulating your body with leggings under pants or a thermal or wool shirt under your regular clothing can really make a difference in keeping you warm. You want these underthings to fit tightly, but be careful that you don’t buy them too short—this will resort in gaps of exposed skin that can get cold fast! The great thing about leggings is that they can double as warm, cozy pajamas as well. If you buy them a bit baggier, you have a pair you can lounge around your dorm in or wear during slightly warmer Fall and Spring temperatures. Wool is known to provide an excellent amount of insulation and is a great pick for all things from sweaters to socks. Wool, unfortunately, can have a reputation for being itchy, but depending on the brand you purchase, you shouldn’t have a problem with that. If you do own an unbearably itchy wool top, consider some home remedies to smooth the scratchy fibers—like soaking your sweater in glycerin or washing it with vinegar. Simply search for some ideas, and give it a try! It’s worth it for the opportunity to wear a super warm sweater!